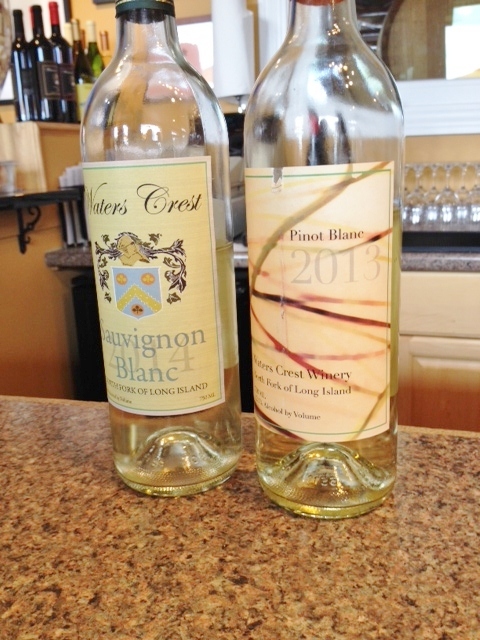 “This was a great year for whites, but probably not for reds,” opined our enthusiastic and knowledgeable server, Adam, at Waters Crest winery, one of the semi-hidden gems of the North Fork. I love to listen to people talk about something they are passionate about, and Adam certainly fit that description. Though he is working for Waters Crest at the moment, he hopes someday to have his own winery, and meanwhile the good part about working for a small place like this is “you get to do everything.” The good part for those of us who are curious about various aspects of wine making is that the servers here have always been able to do a great job of answering our questions. 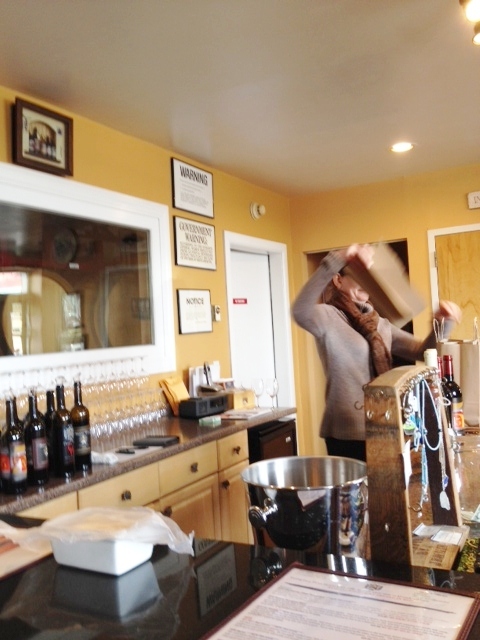 Though you can see the wine-making facility through a window in the tasting room, you may wonder where the vines are. Jim Waters buys his grapes from local North Fork vineyards, then makes the wines himself. When we first arrived we had the room to ourselves, but then a couple of small groups came in, all clearly regular customers who knew exactly what they wanted, including which cheese from the small refrigerator to get and which pizza they wanted heated up. The tasting room is hidden in a strip of stores off Sound Avenue, with the entrance on Cox Lane, just to make finding it even harder, but they hope to soon have a spot on the Main Road, which will be great. 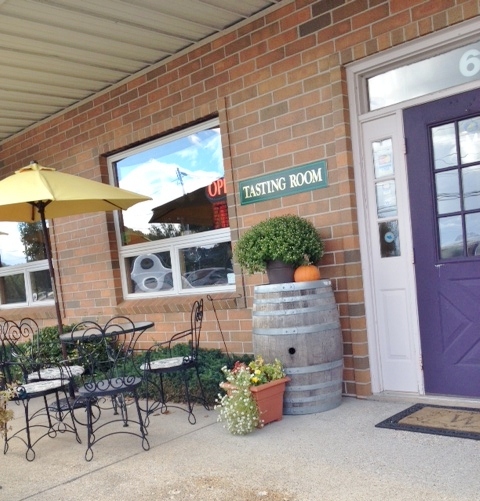 We have been a fan of this tiny place ever since our first visit, as the wines tend to be both tasty and interesting. 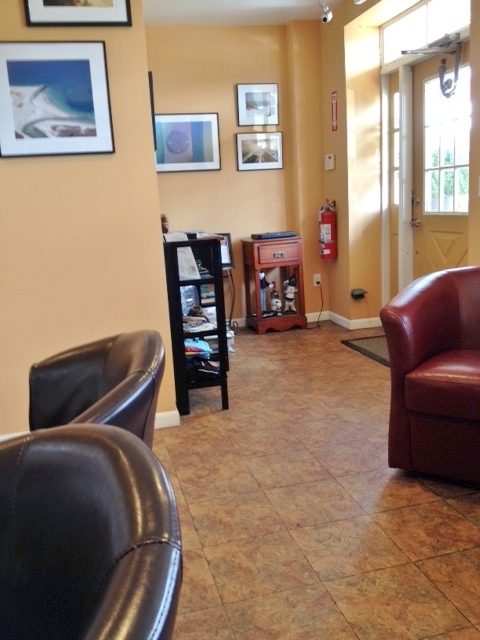 The room is small, but newly furnished with comfortable leather stools and chairs. 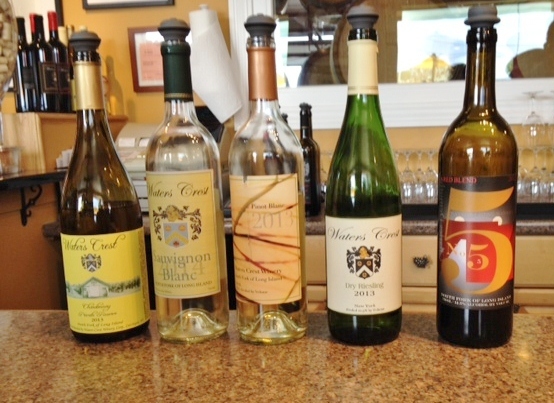 The tasting menu offers all seven of their wines for $15, and so we opted to share a tasting. “We treat this more like a Sancerre,” noted Adam, using cold fermentation and no oak. The aroma is quite floral, with notes of pineapple and lemon, which also describes the taste. As is often the case with this grape, it would be perfect with local oysters. What is “indigenous yeast” and how does it work? If you want to know, ask Adam! Most winemakers will treat their grapes with SO2 when they come in from the field in order to kill off the naturally occurring yeasts so that they can then introduce the yeasts they have bought, thus controlling the effect of the yeast. With this pinot blanc (and also, as we discussed, Channing Daughters’ L’Enfant Sauvage and Roanoke’s The Wild!) the natural yeasts were allowed to stay on, which also meant that fermentation took longer. The wine was fermented mostly in steel, with just a touch of oak. The result? Lovely. Aromas of green apple and minerals, with a touch of funkiness preceded a taste of tart green apple and pear salad, with some nice minerality. Dry? Bone dry! This wine is made with grapes from upstate, from Gold Seal Vineyards, but it is not at all sweet. .025 residual sugar, says Adam. Interesting flavor, with notes of citrus and stone and a touch of funkiness. Unlike most rieslings, which I would choose to have with spicy food, this would go better with duck, sausage, or, suggests Adam, knockwurst. Good call. After a time of steel fermentation, this gets six months in new French oak, so it is not too buttery. You do get some typical butterscotch flavors, along with lemon and other citrus. Good, a not untypical chard. The mixture of 50% merlot and 50% cabernet franc is blended in the bottle after being independently fermented. 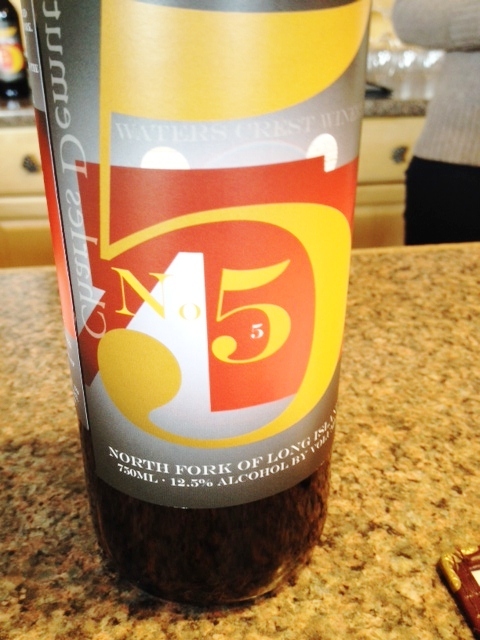 This has my favorite label, inspired by the famous painting by Charles Demuth which was inspired by his friend William Carlos Williams’s poem “The great number 5.” The aroma is typically cherry, like a merlot, and so is the taste. It is fairly dry, and the tasting notes suggest some rhubarb in the flavor. In any event, it is a good barbeque wine, and would be great with burgers. The lineup so far, with the Charles Demuth-inspired label on the far right. “Now you can see how our wines age,” notes Adam. “The tannins have fallen off.” This has a very distinct taste, combining black pepper, tobacco, and smoke with the fruit flavors, and is balanced and mellow. I start to say roast chicken, and then we agree it would be great with lamb. The 08 is almost all gone, as they found a few cases forgotten in the warehouse! After three days on the skins (which is fairly long) the wine spends two years in new French oak. It was worth waiting for! 2010 was a great year for reds on the North Fork, and this one, which garnered 90 points in Wine Spectator, is excellent, with lots of tannins, black cherry , and a delicious aroma. It could stand up to a good steak. If you’re counting, you know we should be done, but as a reward for our intense interest in the wines, Adam gives us small tastes of two Bordeaux blends from two different years just to show what else they can do. These are Right Bank blends of mostly merlot, plus cabernet franc, cabernet sauvignon, and petit verdot. Though the only difference in the wines is how long they have aged and the year of harvest, they are quite different. The 2010 is dark red, while the ’07 is more of a garnet color. The ’10 is really good, with tannins which finally make sense to me of the term “chewy tannins” and lots of layers of flavors. The ’07 is almost over the hill, with asparagus in the aroma and a lack of depth. Though it is not bad, I would definitely choose the ’10, and drink it soon! Our bonus tastes. It pays to be serious about your tasting! Reasons to visit: a chance to talk to knowledgeable servers (one time it was Jim Waters himself) and learn all about the wines; the Pinot Blanc, the Red Blend, the Cabernet Franc, the Merlot Grand Vin, the 2010 Campania Rosso; no crowds on a busy weekend (though this may change once they move to a more public spot). “Has it been that long? !” exclaimed Jenny, when we admitted that we hadn’t been there since August of 2012. 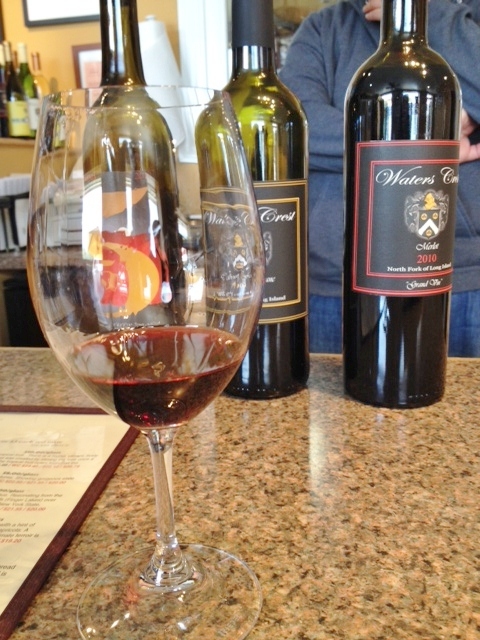 If you want a truly personal experience at a winery, Waters Crest is one of the places to go. Despite its unfortunate location—in a commercial strip on Sound Avenue and Cox Lane, just around the corner from the Southold Transfer Station (a.k.a. town dump, with its complex odors of rotting garbage and recycled paper)—the tasting room is quite cozy and the wines worth trying. 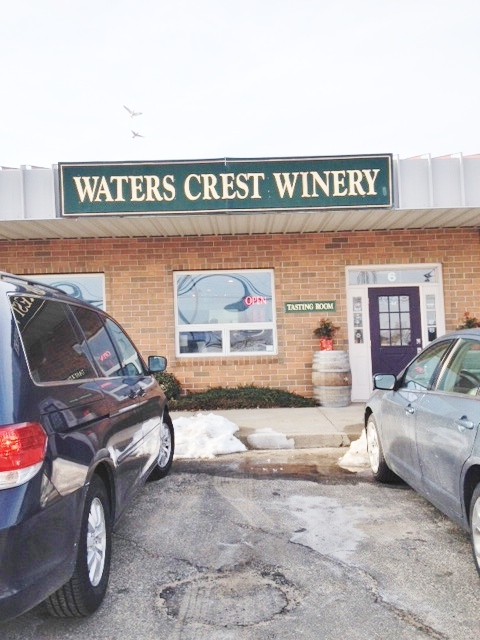 Jim Waters does not have his own vineyard, and so buys his grapes from North Fork vineyards, plus Riesling grapes from upstate, near Seneca Lake. However, according to his web site he “hand chooses” the grapes, and he is certainly very hands-on when it comes to making the wines. His general style seems to be to go for dry wines, which we tend to like. The tasting menu lists seven wines, three whites and four reds, and you can taste all of them for $15. 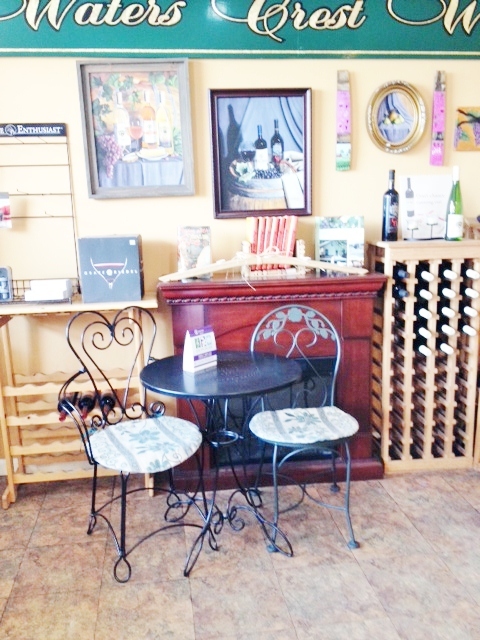 In addition, if you buy four bottles of wine your tasting is free. We opted to share a tasting, and noticed that the wines are served in Reidel glasses, a luxury touch that Jenny admitted made her a bit anxious when it came time to hand dry them. You can also buy a few wine-related gifts, including handsome cloth wine gift bags hand-made by Jenny’s mother. We also learned that we just missed a chance to visit with Jim’s father, who was hanging out in the tasting room during our last visit. As I said, it’s a personal experience! Jenny packs the wines we bought. This is their steel-fermented Chard, with typical aromas of apple, pear, and grass. We taste a lot of lemon—perhaps too much lemon. Not a wine for sipping, though it might be better with food. After steel fermenting, this one spends two months in oak to mellow it a bit. We can sense a touch of that caramel, but it is not too oaky. This is also dry and rather light, with lots of green apple tastes. In a nice touch, Jenny rinses the glass with a drop of the new wine before pouring the taste. Jenny agrees with us when we decide this is our favorite of the whites. The aroma is very flowery, with lots of honeysuckle, as is not uncommon with upstate fruit. However, it avoids the over-sweetness I often sense with upstate grapes, and has a pleasant minerality and citrus taste. It would be great with oysters! Time for a new glass as we switch to the reds. 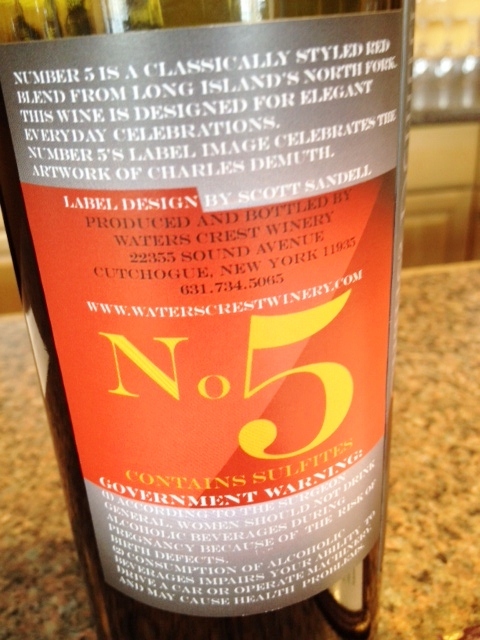 As soon as I see the label I exclaim that it reminds me of the famous painting by Charles Demuth of “The Great Number Five,” which was inspired by a poem by his friend William Carlos Williams. If you look at a reproduction of the painting, you’ll see references to Demuth’s pal Williams in it. Jenny confirms that the label was designed to evoke this painting, but the name was inspired by the idea that this is a “five days a week” wine, perfect for casual weeknight dinners. We agree, and enjoy the blend of Merlot and Cabernet Franc, the very cherry aroma and the dry light taste. One could have this with anything from salmon steaks to burgers. Another typical Long Island Merlot, this has aromas of blackberry and eucalyptus and nice fruit taste, with a tart finish. 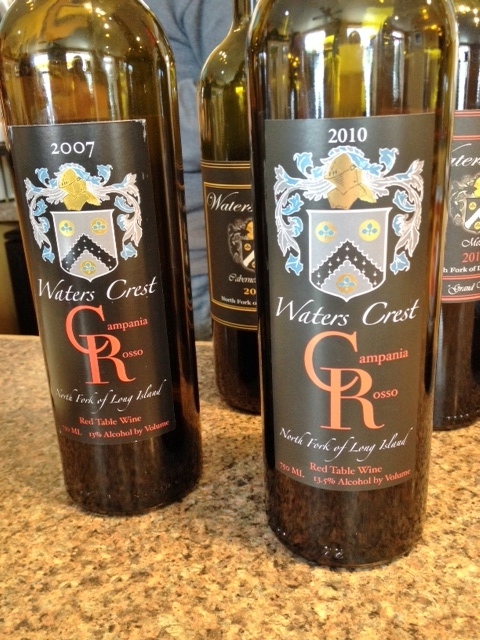 Jim Waters changes the blend on this wine from year to year, depending on which grapes he chooses. The ’08, which was listed on the tasting menu, was a classic Bordeaux blend, but this one is 78% Merlot and 22% Cabernet Franc. ’09 was a difficult year for red grapes. There’s a bit of a funky aroma, but the taste is good, with plenty of fruit, and we guess it will age fairly well and end up tasting better. Nice legs. The Cab Franc spends 20 months in French oak, and we can taste a bit of that woody flavor. I smell a bit of funkiness here, too, but also plenty of cherry. It’s a nice wine, though not worth the price, we decide, though Jenny suggests that this, too, would benefit from a couple of years of bottle aging. The reds are suffering in comparison to a very expensive French red we shared during the week with a friend, so we have to banish that wine from our memories in order to appreciate Long Island reds for themselves. We decide to get two bottles of the Riesling and two of the “5” for everyday drinking, and then discover that the tasting is thus free. If we had only opted for three bottles, Jenny says she would have informed us of the deal! Reasons to visit: an intimate, personal experience; the 2012 Dry Riesling and the “5” Red Blend; a free tasting if you buy four bottles.